Update: I have noticed this post getting more hits on google lately. Below, you will find the first take on the lamb meatloaf muffins, but there is also a new post with an updated recipe for the muffins as well as a homemade tzatziki sauce that complements it perfectly. The recipe below works well, but I find this updated version to be better. This is a first – instead of a full new recipe, I am posting a brief update on a previous recipe. One of my favorite things to make is meatloaf muffins. I use ground chicken most often because it is a great blank slate to build flavors. However, tonight I decided to take a detour and make the meat itself the star – and lamb meatloaf muffins were born. One of the key ingredients in these muffins was a Greek seasoning blend. I typically like to make my own spice and herb blends, but sometimes it is impractical to keep too many single dried herbs on hand. The shelf life of dried herbs is limited, and I would likely end up throwing many of these components away because they would lose their potency before I would be able to use them all. If you choose to mix your own, however, the blend I used contained onion, garlic, oregano and mint. The process is more or less the same as my original chicken meatloaf muffins (which can be viewed here:https://jasonricemd.wordpress.com/2012/11/29/chicken-meatloaf-muffins/). There are a few changes, most importantly, I baked the lamb muffins at 400 instead of 375, primarily to get a little bit of a crust on the meat. Otherwise, the procedure is essentially to mix all of the ingredients in a bowl, form loosely into balls, place the balls into a non-stick muffin pan lightly lubricated with olive oil. Bake for 30 minutes. After making these, it was very apparent that I should have made some tzatziki to go with it. I have done this in the past when making lamb burgers, so I’m sure that recipe will find its way onto this blog when we get back to grilling season… Nonetheless, they were delicious, and are an excellent way to introduce lamb to younger eaters in a very accessible way. Enjoy! 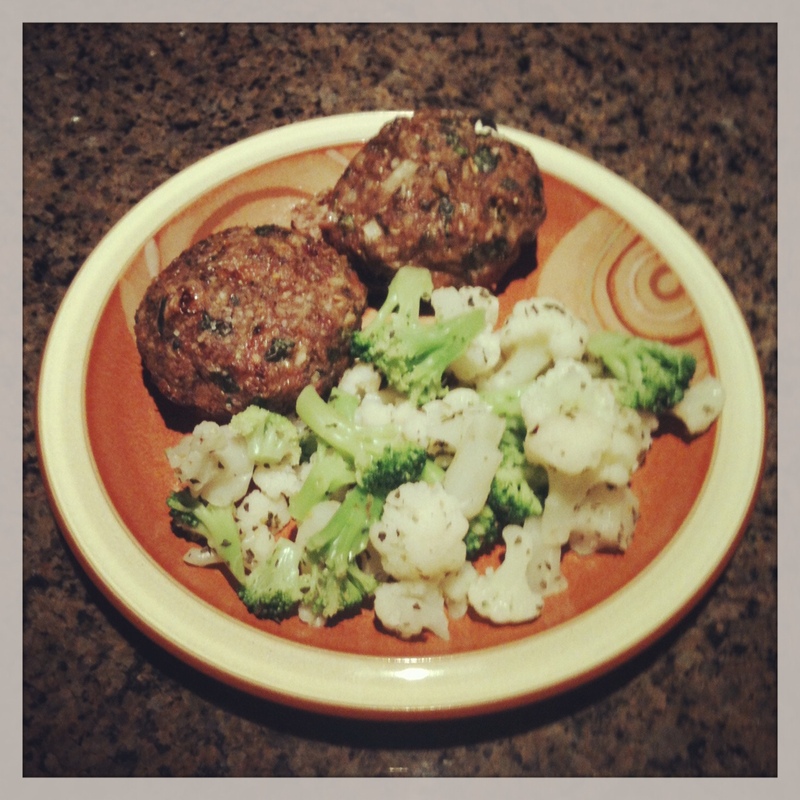 Lamb meatloaf muffins served with broccoli and cauliflower seasoned with Greek herbs and garlic.